The Eddie Bauer Mountain Winter Games landed in Vail last weekend and was a great time as expected. Kristine & I always look forward to this weekend in the winter as well as its sister weekend in the summer, the Teva Mountain Summer Games. As a friend described to me, these games are in a way the “Hippy Olympics”. I thought that was hilarious. While these games are not riddled with dreadlocks and burlap shirts and shrouded in marijuana smoke much like a Widespread Panic show in Athens, GA, they are not your typical events. With events like ice climbing, telemark big air competitons, nordic skiing, and running/skinning up the ski mountain as fast as humanly possible, the games attract the heartiest and fittest athletes in the area. People who attend and compete in these events are all very fit and have a love for the outdoors and mountain sports. Though Teva is no longer the headlining sponsor for the summer games, GoPro stepped up and took the reigns. 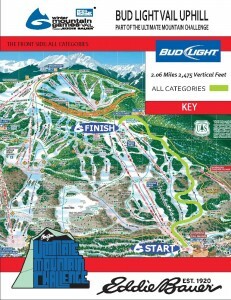 We entered the Vail Uphill race last year and did pretty well in the Heavy Metal category for our 30-39 age group, i.e. we both got 3rd and the bronze medals. 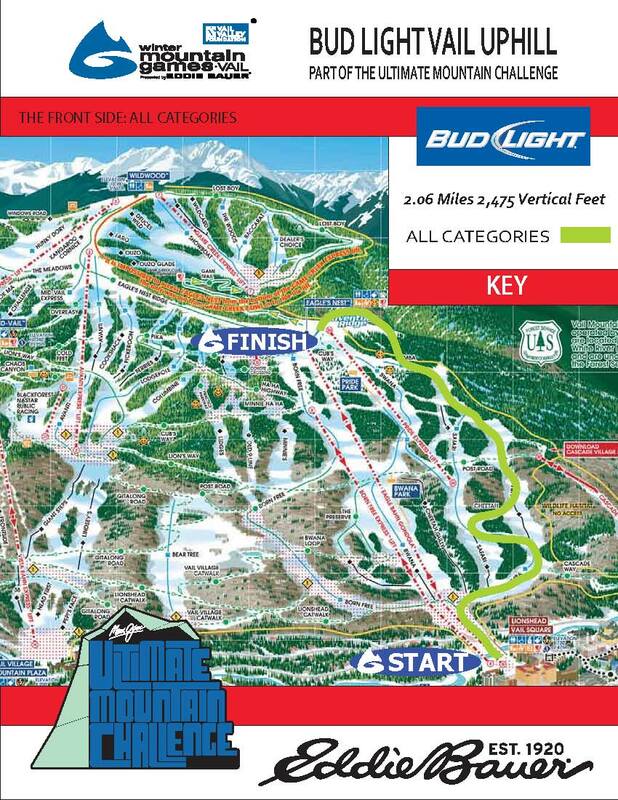 The Vail Uphill essentially races straight up Vail Mountain mostly on the blue Simba ski run from the bottom of the gondola to the top of the gondola gaining 2,475 vertical feet in just over 2 miles. 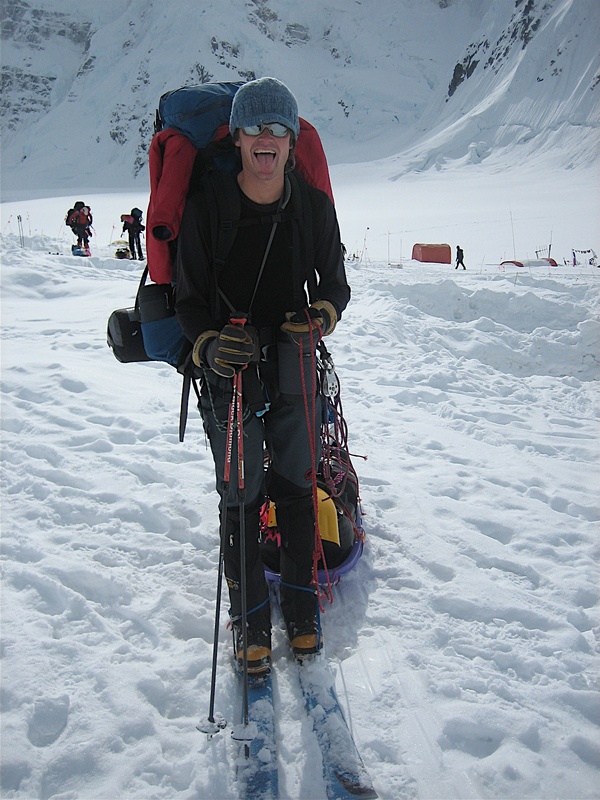 There are two categories in terms of mode of transportation up the course – the Open category on foot (yaktrax, microspikes, or snowshoes) and the Heavy Metal category on skis (telemark, AT, or splitboard gear). Now, on foot is always faster since you have so much less weight on your feet. I’ve read that every additional pound on your feet is like an extra 5 lbs on your back. Meaning that if my telemark setup (boots, skis, & bindings) weighs 15 lbs overall and someone’s else’s AT race ski setup weighs 10 lbs, then that’s like me carrying an equivalent 25 lb pack on my back in addition. Now, that’s quite a difference. However, with more people entering the Open category last year, Kristine & I entered the Heavy Metal category with our backcountry telemark setups. As stated before, we placed 3rd in our respective male & female age divisions and were pleased with the results. However, the folks that beat us had the extreme lightweight randonee race AT setups, which are much lighter even than our telemark setups. I didn’t understand that the randonee race gear was in the “Heavy Metal” category, but it was. My understanding was that “Heavy Metal” meant a ski setup on which you would use in the resorts and in the backcountry. Not one on which you could barely ski down an inbounds resort ski run. However, the race folks didn’t see it my way. Cest la vie, I guess. Its all about personal satisfaction and knowing what you can do with what you got. I’m not about to invest in a randonee race AT setup just to do these uphill races. My good friend Megan Gilman, wife of J, then asked me “Buddy, why not use the old Denali skis? Might as well make it a bit more even rather than having your setup so much heavier than others.” She had a great point. She’s one smart cookie. I don’t know why we all didn’t think of this option sooner. While its honestly not a huge deal to me whether I do well in a race in relation to others (for me, its just about doing well for myself and in relation to what I personally can do), it would be nice to have a lighter setup to be a bit more competitive with others. So, the old Denali setup came out of retirement. Its a combination of a lightweight K2 AT ski with an antique mid 1990s Silvretta 404 AT binding that can accommodate a mountaineering boot, specifically my Koflachs. 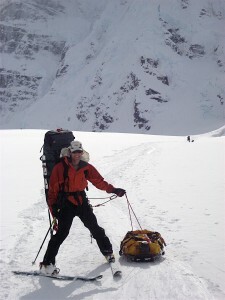 We used these on Denali as our mode of transportation up to 14,000′ camp. While I can’t ski them downhill more than I can fly to the moon, they are light on the uphill and allow me to use my Koflach mountaineering boots, which are significantly lighter than my Scarpa T1 telemark boots. J can ski these skis with his Koflachs exceptionally well. In fact, he just skied this setup the weekend before on Culebra Peak. Then again, he is an exceptional skier and I am not. Skiing this setup in Koflach mountaineering boots is like skiing in tennis shoes – absolutely no calf support like a ski boot gives. Booster straps do help around the top of the mountaineering boots yet it is still very tough. J makes it look easy though. J still has and uses his old Denali K2 ski/Silvretta binding setup though I sold mine years ago, which was a Solomon Pocket Rocket ski with the same Silvretta 404 bindings. Kristine decided to enter the Open category on foot with her microspikes while my plan was to enter the Heavy Metal category with J’s old Denali setup. My good buddy Joel Gratz, owner and founder of the wonderful and very successful powder forecasting website called OpenSnow, sponsored me in a way by paying my entry fee. 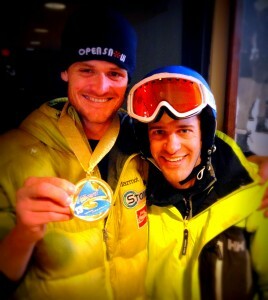 Joel joked that I was Open Snow’s 1st sponsored athlete. It was a gracious gesture on Joel’s part that I really appreciated. I tested J’s old Denali setup on Saturday evening with Kristine & the dogs up Arrowhead just to make sure I had the balance down on these skis since I had not been on them in 7 years. I did actually ski them down Arrowhead which was probably like watching a beginner skier on the bunny hill. I’m sure it was a bit humorous for Kristine and the dogs. The setup worked well and would be much lighter than my telemark boots and telemark skis, though not nearly as light as the randonee race AT setups on the market. The Vail Uphill race started at 7am on Sunday morning in cold temperatures and a snowy atmosphere. We had other friends in the race as well all on foot in the Open category. The race went fast and the temperature felt good. I was sweating, but not too much as I do when its warmer. I knew there were a few Heavy Metal folks in front of me, all of whom had the lightweight randonee race AT setups complete with spandex speedsuits. Everytime I saw a racer with the spandex speedsuits, it made me compete harder. I just find it funny, that’s all, as does Kristine and most of our friends. J’s old Denali setup did allow me to go faster for sure. With less weight on my feet, my legs could move faster and my body exerted less energy in each stride. Our good friend Chuck Pratt, who was there cheering on his fiance, Jennifer Lowry, was there to run with me the last hundred yards to the finish line. I definitely felt that I was faster than last year’s time of 50-51 minutes and I ended up finishing in 46 minutes and 3 seconds. I was pretty pleased. This time landed me 1st place in the male age 30-39 Heavy Metal category. Better yet, I took home the gold (of the Hippy Olympics, that is), which, I believe, is my first gold medal ever. I guess its as close as I will get to receiving a real gold medal. There were a few really fast Heavy Metalers in front of me, however. One young guy in the age 20-29 division and two older fellows in the age 50-59 division all of whom were amazingly fast. Of course, the Open category had so many fast guys in the 32.5 minute to 40 minute range, which is incredible. Maybe next year, I will enter the Open foot category and see where things land. All in good fun, though. Kristine came in at a dazzling 48 minutes and 7 seconds, much faster than her 2012 time, and placed 5th in the tougher female age 30-39 Open category. We all drank hot chocolate and ate muffins during the awards ceremony and had a great morning. We ran into Joel on the way out with our other friends Jesse, Jenn, and Tania as they were all going to ski the mountain, and he was ecstatic with my gold medal. He even wanted pictures with me. Joel said “Well, let’s do it again next year and make it two in a row!” Ha. I told him that it sounded good to me and I will try. Maybe Kristine & I will do the coed ski-mountaineering competition as well. Kristine & I were back home at 11am to play with the dogs and enjoy a much needed nap. Anyway, not that Kristine and I are big race people at all, these races are fun to do with good swag bags and we both look forward to the GoPro Summer Games come June. A big thanks to Joel & OpenSnow!